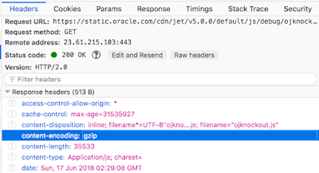 With the recent releases of Oracle JET – CDN support in your app can be enabled easily. By default JET app is set to download all JET toolkit related scripts and static files from the same host, where application is hosted. You can track it easily through network monitor, you should see such files as ojknockout.js, etc. fetched from same host: Read the complete article here.